A Great Cormorant. Obviously not a very shy one. Thanks, Alesh. This post prompted me to figure out once-and-for-all the difference between a cormorant and an anhinga. 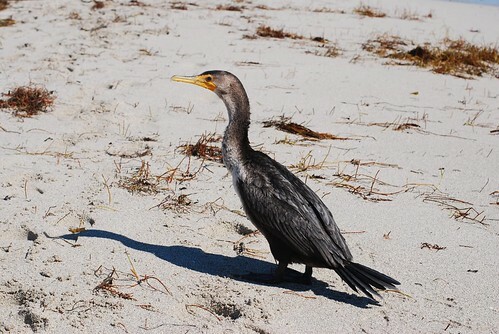 Among other things, anhingas have the pointy beak. This guy has a little hook at the tip of his bill. It’s easy to see in the big size of the photo. BTW, “not very shy” = I shot this with a 75mm equivalent lens, crouching about 5 feet from him.